Started in 2013 with the efforts of Freeman Dryden, the Organ Rescue Project (ORP) consists of a group of volunteers, focused on preserving worthy pipe organs. This may include acting as brokers between current and prospective new owners; assisting with disassembly, moving, and/or reassembly of an instrument; or even providing a complete end-to-end service. To date, five organs throughout the Maritimes have been saved through the efforts of ORP members. the Organ Rescue Project is pleased to announce that moving and re-installation of Casavant Op.717 is complete and awaiting professional voicing and tuning on Aug. 13th and 14th, 2015. Replacement value is estimated at $220,000. 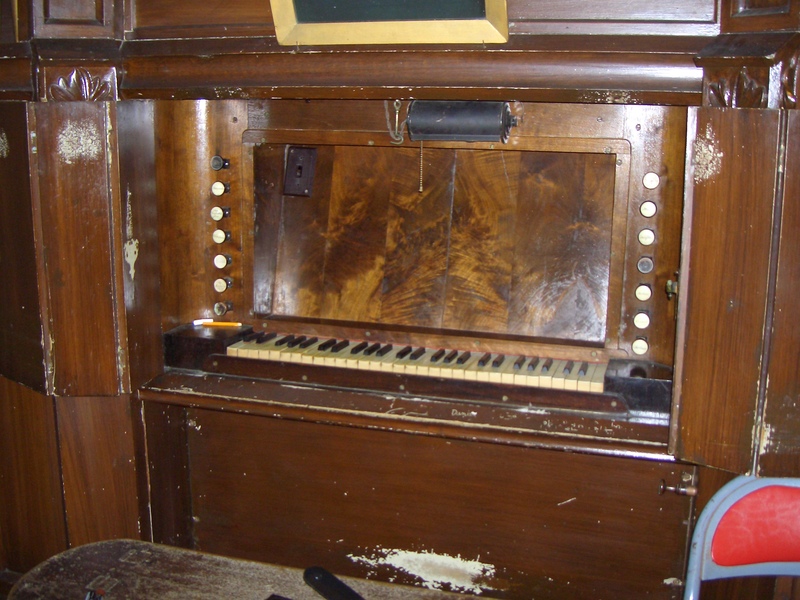 This organ, the generous gift of Milton Christian Church to the Sherbrooke Museum, was dismantled, transported, and re-erected by the volunteer crew of the Organ Rescue Project with yeoman service from organisations such as the Liverpool Volunteer Fire Department, Budget Truck Rentals, the Halifax Music Co-Op and the amazing Carpenter Shop and administrative staff at the Sherbrooke Museum. The current configuration being somewhat different than in its previous location, mechanical modifications were designed by Freeman Dryden and Andrew Touesnard of the ORP and precision fabricated by the Museum’s Wood Shop crew and Blacksmith. The organ’s original feeder bellows are intact and in excellent shape and Museum staff are currently fabricating a replacement for the bellows’ long-lost pumper arm and linkage, so that in addition to being winded by an electric blower (installed in the 30s) it will be able to be hand-pumped at special historical occasions. An official unveiling and dedication was held on Aug. 15th, 2015 at 2:00 pm. On January 5, 2015 Casavant Op. 1643 (II-19; EP; 1940) was loaded into a truck and transported to the fabulous new home of the Halifax Music Coop (the large, resonant GYM of Brunswick Street United Church), where the process of re-erection will begin almost immediately. The hope is to have it used for practice, recitals, continuo for the HMC Orchestra, and its reconstruction will provide keen HMC members and others with some valuable hands-on Organ Building experience. A “Red Letter” Day for the Organ Rescue Project! The future, for Op.1643, was looking really bleak just days ago, but thanks to the initiative and connections of John Overton and John Bogardus this fine little organ has been saved and will become a well-used asset for HMC and beyond its doors. THIS IS ALSO YOUR OFFICIAL INVITATION to come to Kentville on Jan.5 to assist with final dismantling and packing, and the loading of the truck. ALL shapes, sizes, ages, and genders can find useful work to do. Please contact the undersigned if you have any questions about what you might be able to contribute. Even those who can’t actually BE THERE could help by providing box lunches or some expense money for those volunteering to work in Kentville. Thanks to the interest and generosity of the Halifax Centre RCCO we have a TRUCK to transport CASAVANT Op.2543 [III-32; EP; 1959] (Sackville NB) to a Halifax location where the ORP is negotiating temporary storage to at least May 31, 2015, possibly beyond, and thereby saving that organ from a trip to the landfill. Op.2543 was rescued by the dedicated efforts of Rob Summerby-Murray and his son(s?) and Andrew Barss. They have completely dismantled this large three-manual organ and prepared it for packing and transport. Again, volunteers to pack and load this organ are needed and encouraged as above. Thanks to all who have already worked so hard to save these valuable instruments. Pipe Organs have an expected useful life of many decades, even centuries, with regular maintenance if not damaged by improper treatment. We can give you advice on how to maintain, salvage and service your instruments. We are in the process of compiling a list of Organ Parts Wanted, Organs needing a new home, and Churches looking for Organs. 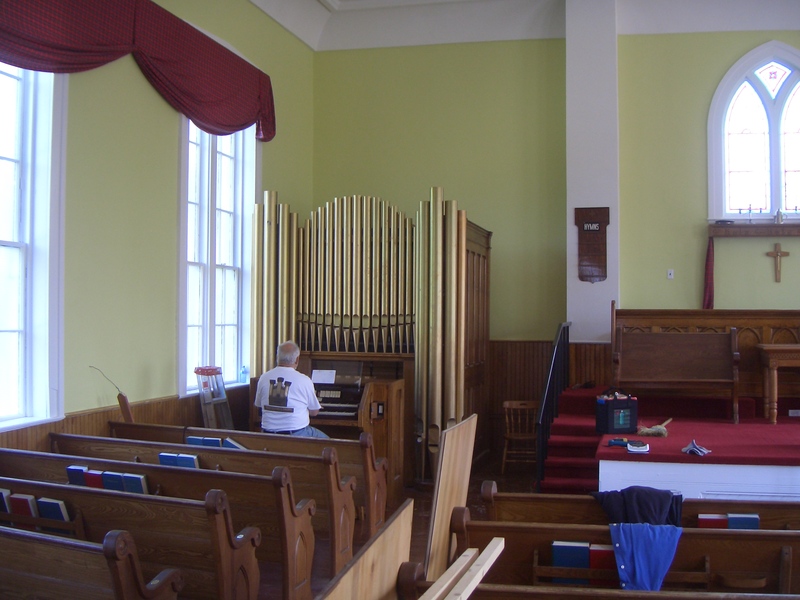 The Historic Organ (circa 1860) of l’Église Notre-Dame de l’Assomption, Arichat (the Cathedral of the Diocese at the time) was mechanically and tonally restored in 2010 by Jean-François Mailhot. It was decided to not restore or refinish the «buffet» but rather that it should wear its signs of long use as a badge of honour. It was originally hand-pumped, had an ersatz blower sending wind down from the attic — freezing in Winter and sweltering in Summer. It now has a modern silent blower drawing air from the same area as the pipes, thus ensuring stable tuning.